Satisfying the biological and behavioural needs of wild animals is difficult, time consuming and expensive. This task is made even more difficult because the natural behaviours, diets and lifestyles of most wild animal species in the pet trade have not been comprehensively studied and therefore are poorly understood. Despite pet industry claims, most wild animals require spacious, complex, specialized environments that are difficult, if not impossible, for pet owners to replicate in a home situation. If you want to own a pet, adopt a dog or cat from your local humane society or shelter. Do not keep wild animals as pets. The wild animal pet trade is a massive, wasteful industry built on the exploitation of animals that are generally ill-suited as pets. While some species are captive bred in sufficient numbers to satisfy demand at certain times, millions of wild animals (particularly reptiles, amphibians, fish and invertebrates) are still removed from their natural habitats for the pet trade. These animals may be shipped around the world, enduring physical hardship, injury, disease and massive stress levels in the process. Mortality can be very high during and after transport. Do not support businesses involved in the exotic pet trade. 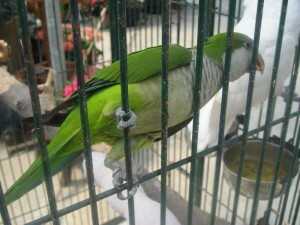 Many pet stores sell a variety of wild animals. While Canadian pet stores no longer sell primates, kangaroos or big cats, many still carry wild animals, such as small exotic mammals, birds, such as parrots, reptiles, amphibians and invertebrates. Encourage retailers to discontinue the sale of wild animals for animal welfare, conservation and human health reasons. If you or your club, organization, school or business is hosting an event, don’t hire a traveling animal presentation, show or exhibit to attend, even if they claim they rescued the animals. These businesses exploit animals, can pose a human health and safety risk, especially if audience members are allowed to contact animals, and they convey to children the message that it is fine to exploit animals for commercial purposes. Many wild animals are subject to inappropriate accommodation and care in pet stores and other situations. While Canada’s federal laws regarding cruelty to animals are outdated and ineffective, there are provincial and municipal laws that sometimes apply to pet store situations. Report all instances of animal neglect and abuse to local authorities, such as humane societies and municipal animal control agencies. If you are concerned about the decline of wild animal welfare and conservation and the human health risks posed by exotic pets, write a letter to your own elected representatives outlining your concerns. Ask them to look into ways of addressing the problems you’ve brought to their attention. Many people don’t understand that wild animals do not make good pets. Inform your family, friends and colleagues that wild animals should stay in the wild and that they should not be captured or bred for keeping as pets. Animals have not evolved to live in small containers, aquariums or cages. Encourage everyone to refrain from ever buying an exotic pet and to speak up when they encounter them in inappropriate situations.